Using ESO's Very Large Telescope, an international team of astronomers has discovered a stunning rare case of a triple merger of galaxies. In this space wallpaper, using ESO's Very Large Telescope, an international team of astronomers has discovered a stunning rare case of a triple merger of galaxies. 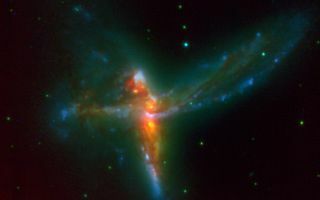 This system, which astronomers have dubbed 'The Bird' - although it also bears resemblance with a cosmic Tinker Bell - is composed of two massive spiral galaxies and a third irregular galaxy.